Giving your child something to roar about on his birthday is every parent’s desire. 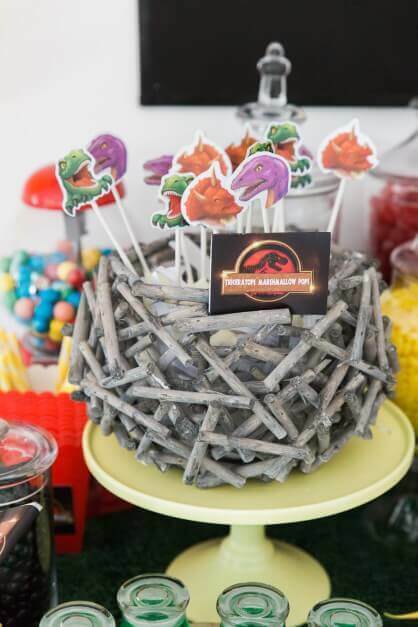 That’s what happened with this awesome Jurassic Park/Jurassic World themed birthday party. 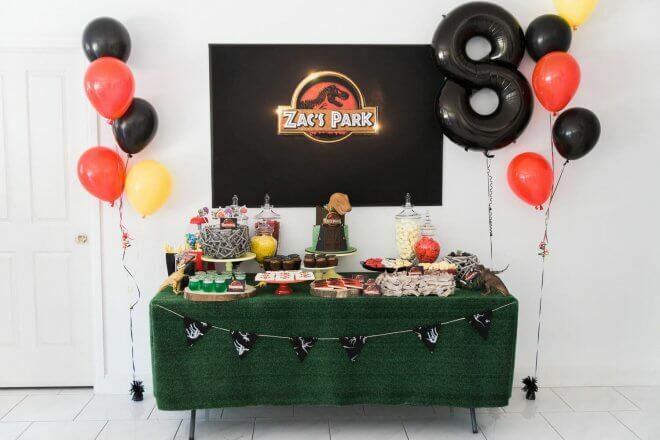 Debbie, of ZigZag Events, created this party dinosaur themed birthday party for her son’s 8th birthday. 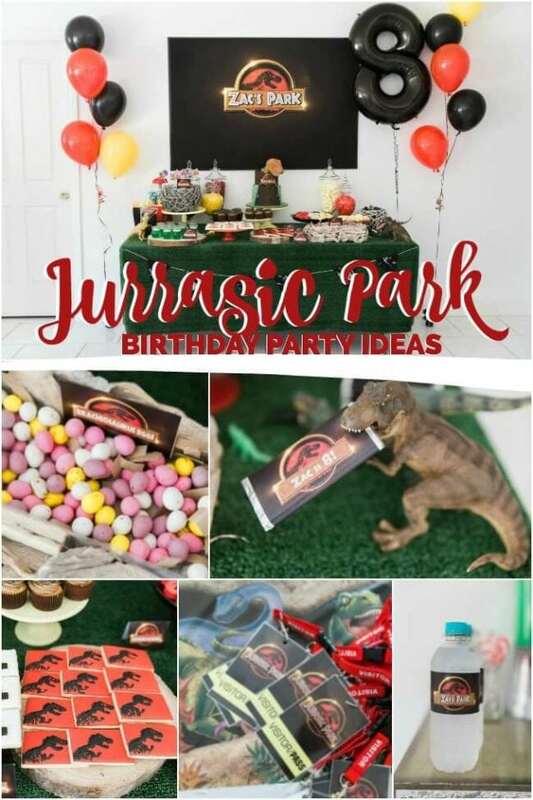 Inspired by his love of dinosaurs and his favorite movie, Jurassic Park (Jurassic World), the party showcases fantastic decorations and party supplies, a super cool dinosaur birthday cake and a dessert table full of tasty party food. Get inspired with these Dinosaur Birthday Cake ideas! The party photos by Wanlapa Tantiprasongchai showcase the imaginative celebration. 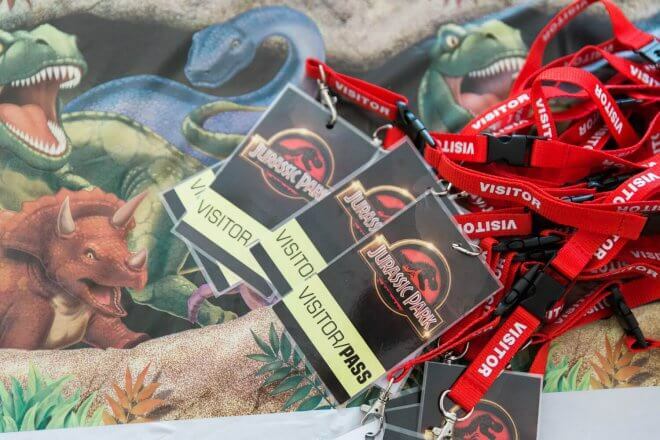 Can you imagine the excitement of being greeted at your friend’s dinosaur party, creatively named “Zac’s Park” (after Jurassic Park) with visitor passes displayed in lanyards? Talk about setting the stage for one heck of a party adventure. Inside, guests were treated to an abundantly stocked dessert table. 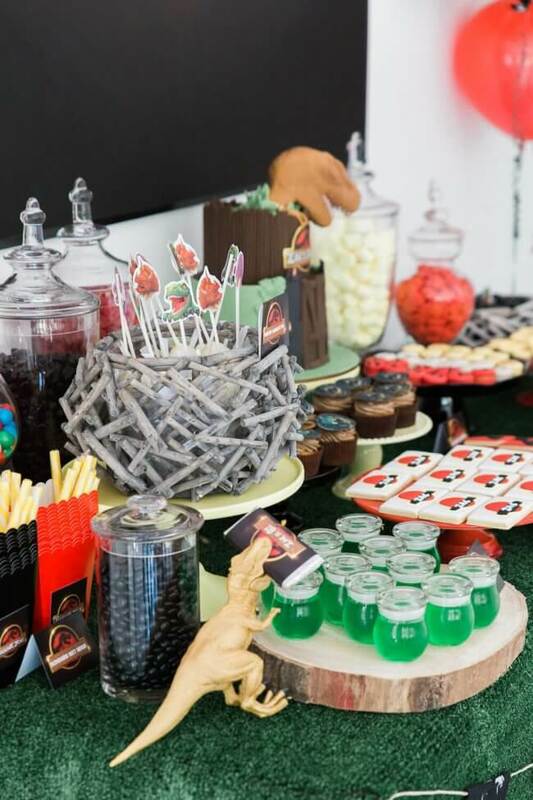 I love how Debbie planned for Jurassic Park-inspired desserts and displayed them on a faux grass table covering, populated with toy dinosaurs who seemed to be perfectly positioned to watch every move. Printable party décor by Yuting Shan helped tie the look of the party together. A custom poster backdrop paired nicely with coordinating dessert party labels and signs. Balloons flanked each side of the dessert table. 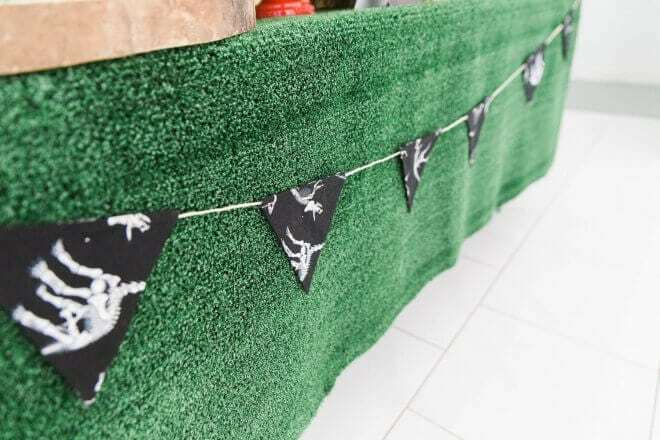 A black and white dinosaur motif bunting gave life to the front of the table. Definitely not to be missed, the cake and cupcakes are crazy amazing. 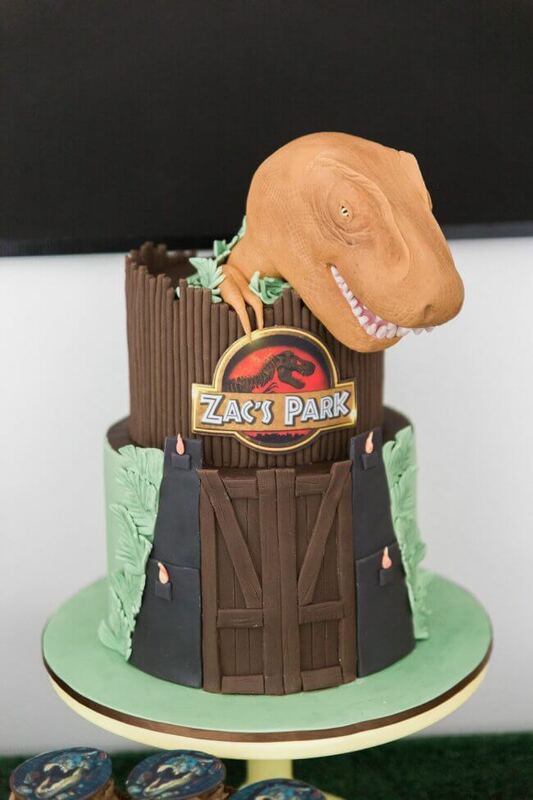 How awesome and realistic does the dinosaur head on that cake look? There can never be enough cake! Cake pops were included in the various cake options. 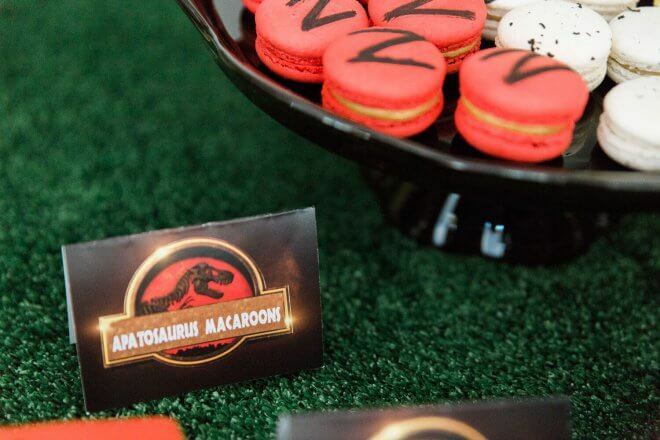 Beautiful macarons by Macarons by Josephine labeled “Apatosaurus Macarons” were enticingly offered on a black cake stand. 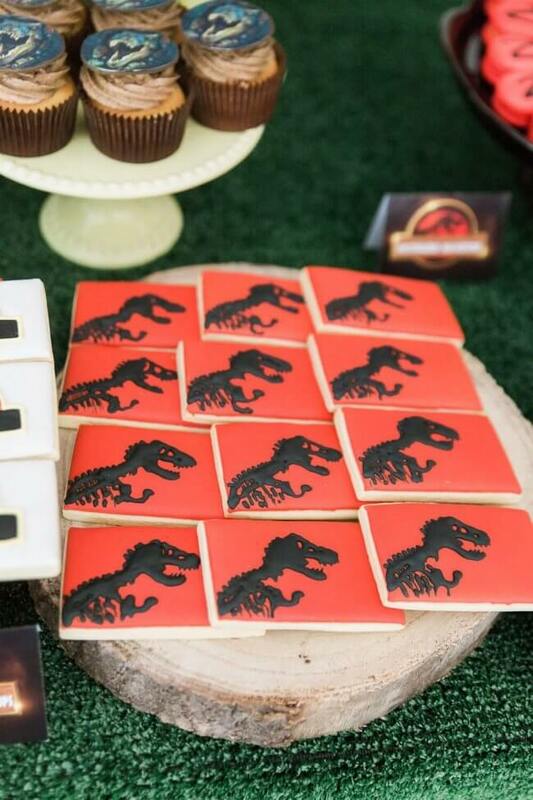 Miss Biscuit designed incredible dinosaur skeleton cookies, which were displayed on rustic wood rounds. I love the pots of green jelly (Jell-O)! 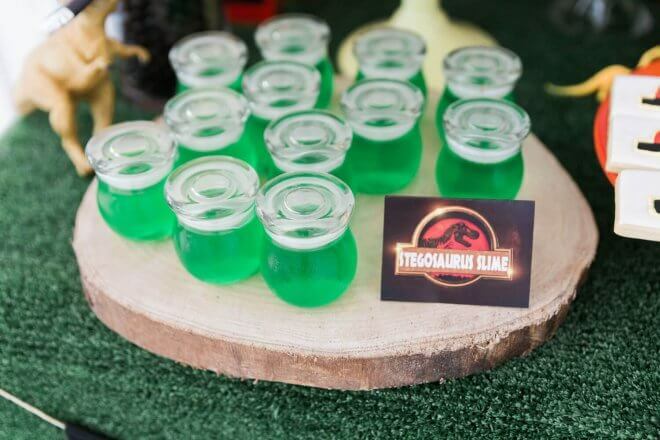 Labeling them “Stegosaurus Slime” was pure genius. “Triceratops Marshmallow Pops” were surely a hit with their dinosaur head toppers. I love the display in a sort of cage-like bowl made of wood twigs. So many varieties of candy were served up in apothecary and candy jars. 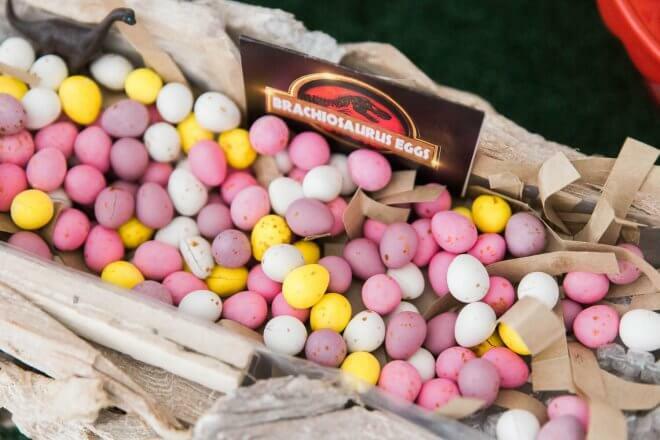 My favorite candy choice was the “Brachiosaurus Eggs”. 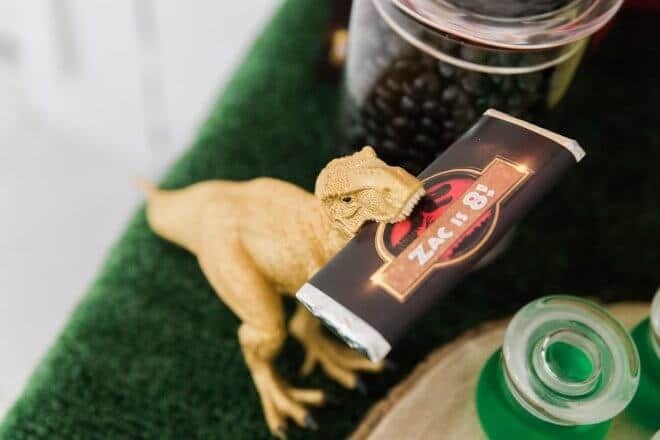 I also thought the array of custom wrapped candy bars held in the dinosaur mouths was pretty creative. Would you dare take the candy bar out of such fierce looking chops?! 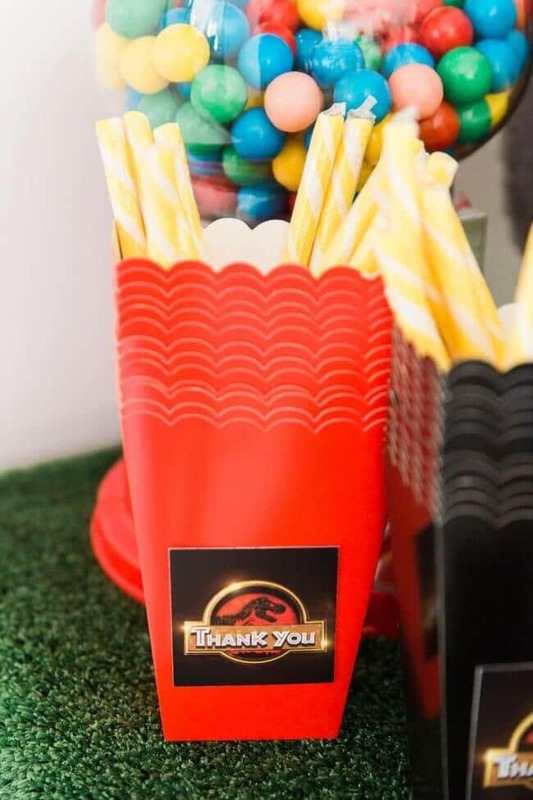 Popcorn boxes affixed with “thank you” labels were on hand. I’m sure dinosaur-loving guests completely enjoyed the chance to choose favorite treats from the table and fill up their treat boxes. 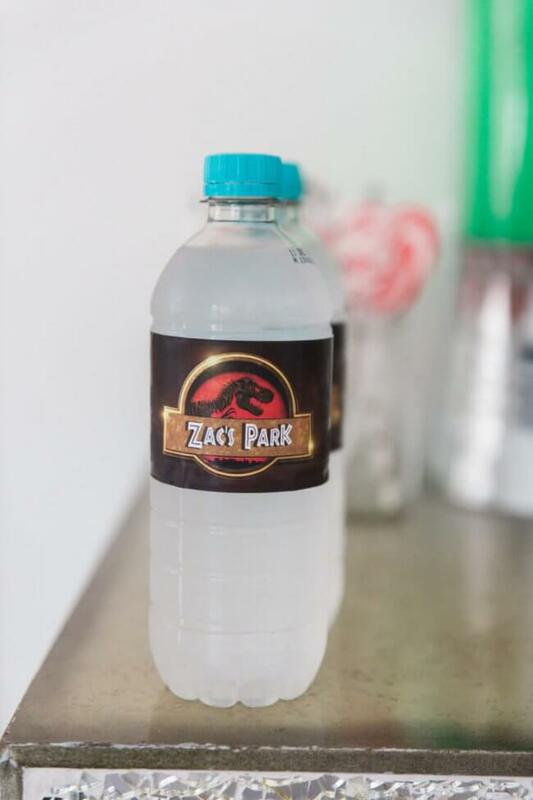 Of course, plain old water would never do for this party; personalized “Zac’s Park” labels gave water bottles that extra coordinated look. 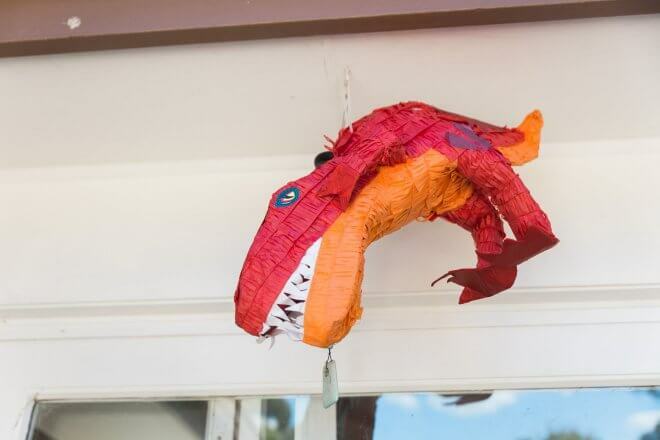 For entertainment, guests enjoyed whacking at the dinosaur piñata. However, the party highlight was definitely watching Jurassic Park on the outdoor cinema screen. 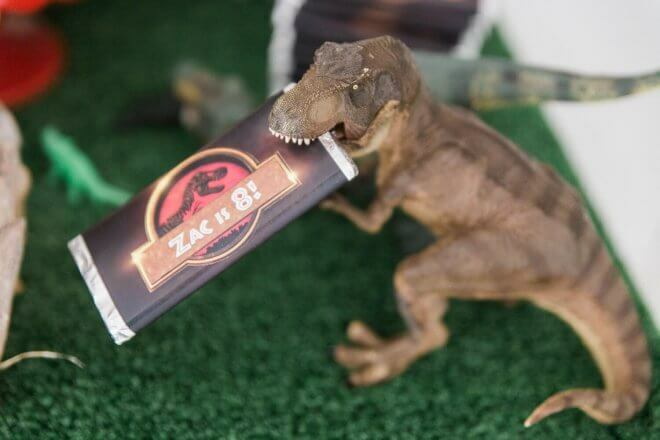 What an absolutely dino-mite way to celebrate a boy’s birthday party. 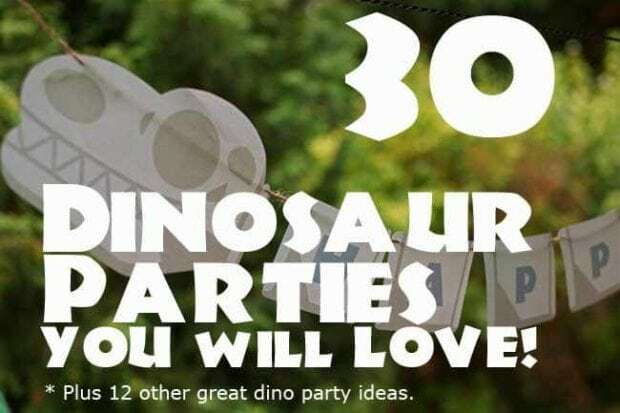 If a Jurassic Park inspired dinosaur birthday party is in the works, these ideas are must-adds to your brainstorming list.